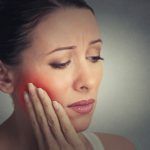 Tooth pain can be caused by many different maladies, but one of the most common tooth pains is sensitivity to hot or cold foods and beverages. Many people feel a sharp pain from sipping ice cold water, eating ice cream, eating soup or maybe even from their morning coffee. 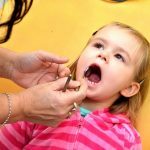 According to this article, a limited study done on tooth sensitivity found that 1 in 8 adults experience tooth sensitivity to extreme temperatures. The cause of tooth pain can vary from person to person but there are a few very simple answers to tooth sensitivity. Tooth sensitivity is often caused when the root of the tooth becomes exposed. The root structure of the tooth, which is also known as dentin, lies just below the natural gum line. The dentin is comprised of millions of small tubes, each of which connect to a nerve ending. When the dentin is exposed to extreme temperatures, it sends a pain signal from the shocked nerve to the brain which causes the eater to register discomfort. One of the most common causes of tooth sensitivity is dentin exposure due to receding gums. 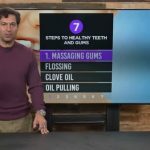 Gum recession can be cause by numerous things, including aggressive tooth brushing or not brushing enough. Aggressive brushing can be identified by taking a look at your toothbrush. If the bristles of the brush are flattened or are going out in all direction, it’s likely that you may be brushing too hard. Try to lighten up a little. After the gum line recedes, you become more likely to have temperature sensitivity. Other causes of temperature sensitivity are tooth grinding and a diet high in acid. Depending on what you enjoy eating, acidity in your diet can be difficult to control. If you have tooth sensitivity, you should be aware of these foods and beverages with a high acid content: tomatoes, tomato sauce, oranges, lemons, coffee, tea, wine, sodas, energy drinks and almost all juices. Carbonated water is ok, but flavored carbonated waters often have added citric acid. Foods that have a high acid content are hard on teeth because the acid wears away the enamel, exposing the dentin and raising the risk for temperature sensitivity. If you do eat a meal with acidic foods, swish with water right after eating. Water will help to neutralize your mouth’s pH or acid level. Be sure not to brush immediately after consuming acidic foods, the acid weakens the teeth and brushing will damage them further. Over-exposure to acid doesn’t always come from diet; people with an eating disorder or chronic acid reflux may also suffer from worn enamel and tooth sensitivity. An over-use of whitening agents can also damage enamel and dentin, exposing nerve endings and causing sensitivity. One of the easiest ways to lessen your tooth sensitivity is to change your toothpaste. Some toothpastes, such as whitening toothpastes or tartar control toothpastes, can exacerbate tooth sensitivity and make it worse over time. Stop using those toothpastes if you have sensitivity ad we can professionally whiten your teeth in our office. If sensitivity persists, be sure to talk to your dentist, he may be able to recommend a sensitivity toothpaste or another course of action. Sensitivity toothpastes, such as Sensodyne, work in a few different ways to relieve pain. Some toothpastes help to rebuild the calcium in the tooth, blocking the small tubes within the dentin and therefore keeping the extreme temperatures from reaching the nerves. Other toothpastes have an active ingredient that actually numbs the nerves so that discomfort is not felt. Though tooth sensitivity can be a real pain, there are ways to treat it and to prevent it from coming back. Be sure to check with your favorite Fort Worth Texas Dentist if your tooth sensitivity persists over an extended period of time.